Dr. Jennifer Bertrand was born and raised in Rochester, Minnesota. She attended the University of Minnesota where she received both her undergraduate degree and her Doctor of Dental Surgery degree. 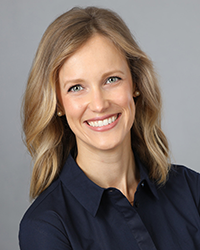 While Dr. Bertrand enjoys all aspects of dentistry, she is especially interested in esthetic dentistry, restoring implants, TMJ and occlusion (bite) issues and dentures. She is affiliated with both the Spear Study Club and the Seattle Southside Comprehensive Study Club. Outside the office, Dr. Bertrand enjoys relaxing up north, yoga, running, playing bingo and piano (but not at the same time), cycling with her husband Dan and spending time with their daughter. "I find the most rewarding part of practicing dentistry is getting to know my patients and often times helping them work through their past dental anxiety so they can achieve optimum oral health. Accordingly, I find it vital that each patient has the opportunity to ask questions, voice concerns and ultimately feel comfortable throughout their treatment."